I said good-bye to Senior and Junior last week and this is their replacement. I got a bunch of stuff I wanted, didn’t really lose any features, dropped my payment and cut my interest rate in half. Why am I naming the new truck Jules, here’s a couple million words. I will say that 6.7L Diesel is a serious kick in the teeth. I am a little sad to let my manual transmission go, but there are upshots to an automatic and this one has a full manual mode. Now to fix the boat for this summer. I will be getting at least one of these wallets to put my insurance and registration info in. I will probably get one for myself as well. Now if you don’t get the tie between the wallet and the name Jules, let me enlighten you. The running winner was Marci, short for Marcellus Wallace until the wife mentioned Jules. I also thought about using the code names from Reservoir Dogs. Deep down I really wanted to do Jayne but another friend of mine’s got that one for her truck. And people seem to think big truck means cut them off. Seriously, people, this things don’t come to a stop fast. Knock that off. A F550 nailing your Prius won’t go well. [It’s that time of the summer again. All the college students are coming back into town and I usually discover this is the case by narrowly avoiding accidents a couple of days in a row as people cut off and generally disrespect my truck. It is amazing the number of people who seem to think that my truck since it doesn’t accelerate like a sports car must stop like a brick hitting the ground. Umm, no, you see there’s this thing called Newton’s laws of motion. That combined with momentum means that the next time you decide to whip around me and cut me off, I may not be able to slow down enough so that your right rear quarter doesn’t hit my front bumper. So as I said on Sunday I put my baby into a ditch. It was a hard hit and had to be winched out of the hole. I didn’t really think about taking pictures mainly because I’m not a big fan of documenting my stupidity. At this point though I kind of wish I had. It would make a great commercial. The drive home on Sunday had a shimmy though the steering and the wheel was no longer aligned. I spent last night with the pressure washer removing the concrete clay caking the tires and undercarriage. I removed a large quantity of clay that was caked on to everything including all throughout the wheel. By the end I was covered in mud from it flying off while cleaning. I only blasted the mud off though, she will get a bath this weekend. Tomorrow, if I get the green light, I shall go do something special for a post. This morning I dropped her off for an alignment check and to have the front end looked at in detail on a lift. Also if they could I wanted my steering wheel put back to center. While driving in this morning there was no vibration through the steering, good it means that the wheel was out of balance from the clay, which I expected. The truck tracked well and didn’t drift so the alignment seemed like it would still be good but I wanted numbers. Well I got the numbers back and everything, remained within spec. I didn’t bump it out of alignment, didn’t bend a tie rod, didn’t do a damn thing to that truck other than de-center the steering wheel. That’s right, all that happened from a trip into the ditch was that my steering wheel was no longer pointed the correct direction for center. 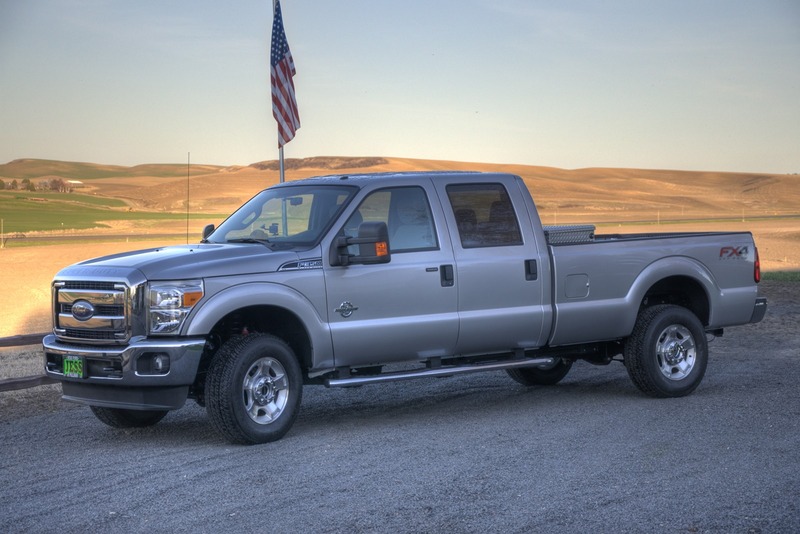 They say “Built Ford Tough” for a reason. I just don’t like finding out or pushing those limits first hand. This weekend she’ll get a nice bath and right now I’m debating on a road trip with her in September. I just need to talk with some friends to see if we can split a hotel room. So, today wasn’t exactly one of my best days. I didn’t listen to instinct. I was taking back roads to the match today and there were thunderstorms last night. Yeah, wet clay isn’t fun to drive on. Doubly so when it is like driving on ice and that’s pretty much exactly what happened. All I will say is the truck is fine, a bit muddy on one side, and need of a visit to Les Schwab’s for an alignment and suspension check. Now, I have had many people tell me that Ham Radio is pointless. Just pick up and use your cell phone. I was merely 12 miles outside of Moscow Idaho, an urban center. Yeah, guess what didn’t work worth a damn and what got a tow truck sent in my direction with a winch. If you said cell phone, you lost, it was my Ham Radio. Cell had 0 signal. Tow truck showed up about 45 minutes later and I showed up to the match 50 minutes after it started. Luckily I was still able to shoot, not only that but first stage I shot everyone’s comment was I need to do something like that before I shoot. What do you mean I hear you ask? Well I shot the first stage in 5.11 and aced it with the exception of a single charlie. Compare that to our local Masterclass shooter who did it in 5.85 and was mainly in the charlie bracket. I was quite pleased with myself. I did OK on the classifier, which was a fixed time stage with a mandatory reload. I was quite pleased with myself that I only wasn’t able to make one shot during the reload string. There was another stage that was actually a blast. It was a bunch of running and gunning. You started with your mags and gun down range on two different barrels with the gun unloaded. Adam (the Masterclass) shooter did a move to load the magazine in the gun straight out of Zombie Land. I will post the video later. It was a fun day for the match. Overall I really am pissed for not listening to my instinct with regards to navigation. Thankfully at most it’s going to cost me an alignment. I’m taking the rest of the night off, I’m kind of feeling really stupid right now for that dumb mistake. Uncle a while ago posted something about the Green Police Audi Super Bowl ad. I fell over laughing at the “Ford Earthfucker” statement and immediately wanted to add my trucks to the list. Phil was able to add his truck however all three of my rigs are work rigs and in the environment where I live, even not working they get a nice coat of dust. Well, today I was finally able to clean all three and set them up for a picture. There is Earthfucker Sr. on the left. A 1997 F350 with a 460 under the hood, and gets me a whopping 11.5 MPG highway, around 9 towing anything serious. In the middle is Earthfucker lite. A 2008 Ford Explorer and gets around 20 mpg on the highway, with the hills around here though more like 18.5-19.5 depending on how I feel like driving. 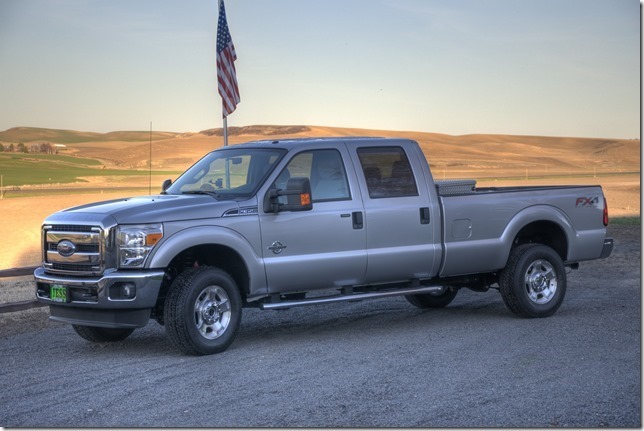 Lastly is Earthfucker Jr. A 2010 F350 Super Duty, with a 6.4 liter Powerstroke diesel and a manual transmission. That gets around 20 MPG highway, and can pull my boat up the Lewiston grade at 75 mph with room to keep going. Many have given me crap about having three large working vehicles. However given the winters around here at times, I don’t want a small car. I want a vehicle that will get me from point A to B without letting me down. The previous Earthfucker lite performed remarkably when my wife walked away from a serious rollover after hitting black ice. We had a small car once during winter, never again. I might feel differently if I didn’t live in the middle of nowhere and have this strong desire towards self reliance. I spend a lot of time during winter helping pull people out and throw up flares at accidents. The large vehicles do not equal being able to fly around, it’s just the ground clearance, power, and weight helps if you’re patient and know how to drive in snow. I could drive a small car, but it’s not my skills I’m worried about, it’s the other people on the road. Especially college students, hence the bull killer on senior.